Short. Somewhat technical with some heavy rough. Take Alt-19 North from Clearwater Beaches to a right on Buena Vista (at the Hammmock Park sign - 1 mile south of Curlew Rd), then left to the NW parking lot (not the one by the playground). I visited this course in October of 2010. Though many of the holes are short, a few very short, they work. Be it around a blind corner, through a tight cluster of trees, over a hill near a swamp, and even across the parking lot, you don't want to be airing out your drives. There is just too much potential for lost or otherwise irrecoverable discs. I kept my drives reasonable and managed not to lose a disc. My fiancée (who's throws are just terribly short) also enjoyed it. The fact that our scores were somewhat competitive due to my unwillingness to throw long seemed to please her. The course itself is well marked and flows well with a wood chip path generally leading you from one basket to the next tee. There is a map posted near the first tee which helps also. The pads are just areas of dirt or mulch but are recognizable and sufficient. I played the course but once. I planned to return but never did as I was on vacation at the time and never returned to the area. 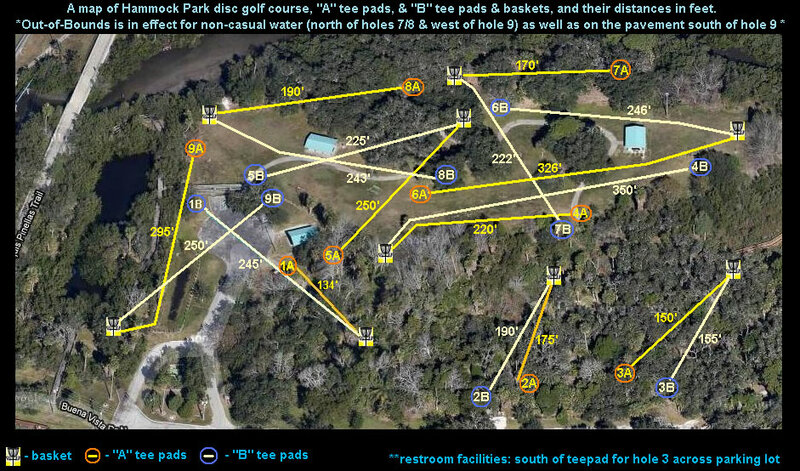 I'd guess that it's all par 3's, maybe holes 6 and 9 are 4's (I usually don't keep score). A very short, enjoyable, maybe even technical course. Worth playing if you find yourself in the area.